As a twenty-two-year-old undocumented immigrant, Saavedra was well accustomed to living in the shadows, keeping his illegal status a secret from even his closest friends. He had no U.S. passport, no driver's license, no Social Security number. In grade school, he missed a class trip to watch a space shuttle launch because flying to Florida would be too risky. At Kenyon, he abandoned his dream of a junior year abroad, knowing once he left the country he might not be welcomed back. A lifetime spent carefully avoiding the authorities, and now here he was at a South Florida border patrol station, all but begging to be detained. And the agent was ignoring him! Two other attempts-at a shipping terminal and an airport immigration office-had failed. This wasn't poetic justice; it was cruel irony. Saavedra marshaled his courage and tried a new tack. In his best broken English, he fabricated a story about an undocumented friend who had gone missing. Now the guard looked him up and down, demanded his name and immigration status. Saavedra quickly admitted to being undocumented as well. Hearing this, the guard produced his handcuffs and slapped them on Saavedra's wrists. Finally, the young activist thought to himself. For a young radical with a rap sheet, Marco Saavedra is surprisingly easy to track down. On most days he operates out of his family's restaurant, La Morada, a popular Oaxacan fonda wedged between a funeral parlor and a beauty salon on a busy thoroughfare in Mott Haven, at the southern tip of the Bronx in New York City. It was cold and sleeting on the winter afternoon I visited, and the warmth inside was amplified by the intimacy of La Morada's décor. The walls were a deep Santa Fe purple, adorned here and there with vibrant oil paintings (some of which I immediately recognized as portraits of Kenyon's Middle Path). A handful of customers lounged at tables, while pots clanged and a flat-screen TV broadcast Spanish-language news. Someone nearby said my name, and I turned to find Saavedra standing beside me. He'd been clearing tables, and I realized: this wasn't just his office; it was also where he worked. On cue, his mother-the chef-emerged from the open kitchen, and Saavedra introduced us. She was beaming, and it wasn't hard to see why. The restaurant was charming, but she was more proud of her son, who, slightly embarrassed, motioned for me to follow him toward the back. I saw it then, Saavedra's mini-command center, fashioned from the four-top farthest from the door. It looked like a computer hacker's desk during finals week. Books and papers (and glasses and plates) lay strewn haphazardly around a laptop and various technology accoutrements. Behind us, separating the dining room from the restroom, stood a bookcase crowded with more paintings and an impressive array of books. Camus and Kafka. Baldwin and Du Bois. Frost and Rilke. Virginia Woolf and Michael Cunningham. The Bible and the Koran. "They're from the public library across the street," Saavedra explained. He smiled self-consciously and took a seat. He was small in stature but well built, with the studied frown, round-framed glasses, and shabby-prep wardrobe of an academic. He closed his computer and cleared his throat. "i'm from a small town of 600 people in Oaxaca, Mexico," Saavedra tells me. "My mom was the oldest of twelve and my dad was the youngest of five, so they grew up in pretty impoverished circumstances. They got married young and decided to relocate to the States when I was three." The year was 1992 and Mexico's pre-NAFTA economy was in shambles. The border back then was not the militarized zone it has become in the years since 9/11, but crossing it, especially with two small children (Saavedra's sister was four), was still dangerous. The family hired a guide, or "coyote," and crossed at night near Nogales, Arizona. After regrouping in Phoenix, the Saavedras made their way to New York City. They settled in Washington Heights, a predominantly Dominican neighborhood in northern Manhattan. "We were surrounded by immigrants," Saavedra says, "but most had already lived there for one or two generations, so we were still outcasts." The family lived quietly and tried to stay out of trouble. Saavedra's mother found work at a garment factory near the Port Authority, and then as a high school janitor. His father took two buses to a job pumping gas in New Jersey, until he was found out and fired for not having papers. Eventually, the senior Saavedra caught on as a food deliveryman and, in what spare time he had, began learning the tricks of the restaurant trade. His son, meanwhile, had started attracting a different kind of attention. After excelling in middle school, Marco was recommended for Prep for Prep, a nonprofit that aids in the education and school placement of promising minority students. He continued to stand out, and in eighth grade was accepted to Deerfield Academy in Massachusetts. "It was a shock," he says. "I had never lived away from home. I was on an equal footing academically, but I was clueless about everything else-like the wardrobe. They tell you coat and tie, so I showed up at my first dinner wearing a full suit and dress shoes. I didn't know you could wear khakis and flip-flops!" But Saavedra was recognizing his otherness in more important ways as well. "Have you ever read Their Eyes Were Watching God?" he asks, motioning toward the bookshelf behind him. "There's that scene near the beginning when the main character sees herself in a photograph and realizes for the first time that she's colored. Deerfield is when I realized I was very much in the minority in terms of where I came from, what I looked like, and, of course, my legal status." Saavedra remembers sitting in the student lounge of his dorm, watching immigration marches on TV for the first time. What a revelation! That a movement existed out there, activists fighting for people like him. He was by now quite familiar with the realities of being undocumented-the truths he couldn't share, the places he couldn't go-so it was hardly a shock when, during his junior year, Deerfield's college guidance counselor told Saavedra some schools might be less amenable than others to his "situation." Dartmouth was struck from the list, and Cornell. But Saavedra already had his eyes on Kenyon. There was something open and accepting about the place. And Kenyon wanted him as well. "We were aware of his status," says Jennifer Delahunty, dean of admissions and financial aid. "He applied early, was qualified for Kenyon work, and could write his socks off. It wasn't a hard decision, though I do remember we had to think about what it would mean to enroll a student who was 'out of status.'" While no law explicitly prohibits colleges and universities from admitting undocumented students, the practice is controversial (in theory, the coveted spot could otherwise go to a legal citizen), and, with financial aid almost always involved, sometimes cost-prohibitive. But Kenyon is hardly alone in its openness. According to a 2011 study, 57 percent of private colleges and 29 percent of public colleges provide aid to undocumented students, although of the 2,650 institutions surveyed, only 447 responded. "It does feel a little risky to be public on the fact that we enroll and fund undocumented students," Delahunty says. "But imagine if we hadn't enrolled Marco?" 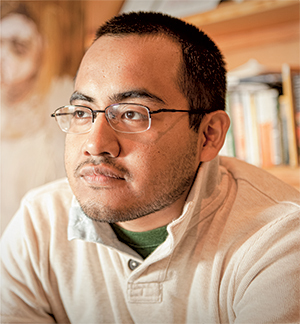 For two years Saavedra kept his illegal status a secret from both friends and faculty. He found solace in Kenyon's religious community, becoming a peer minister, and developed serious interests in painting, poetry, and multicultural literature. But try as he might, the issue of who he was-and wasn't-consumed him, as did his sense of social justice, his need to get involved, to do something. Back at Kenyon for his senior year, Saavedra spoke freely about his undocumented status for the first time. It made him feel emboldened, like he finally belonged, and he began devoting much of his time to immigration issues. The DREAM Act had recently been voted down for the third time since 2001, but another presidential election was coming up and, with a growing Hispanic population changing electoral dynamics, immigration reform loomed large. Saavedra organized workshops and invited speakers to campus in an effort to raise awareness of the issue. At Honors Day, his dedication was rewarded when he won Kenyon's Humanitarian Award and Martin Luther King Jr. Award, the latter presented to the student who has "best promoted social justice through service activities and programs as exemplified by the life and work of Dr. King." "When he got [the two awards] the entire audience rose spontaneously to its feet," Delahunty says. "Faculty, students, administration. Everyone on campus knew Marco." Perhaps no one has influenced the course of Saavedra's life more than Aileen Hefferren, the chief executive of Prep for Prep and a Kenyon trustee. Hefferren '88 H'12 first met Saavedra when he was at Deerfield, and the two became close during his time in Gambier. (Prep for Prep has had a decades-long relationship with Kenyon, and it was a Prep counselor who first suggested the College to Saavedra.) "I was always struck by Marco's soft-spoken intelligence and his very deep sense of justice and compassion for others," Hefferren says. "I respect that he acts on [these traits] even when it means putting himself at risk. I might prefer to protect him, but real leaders sometimes take real risks." Indeed, Saavedra's work as an activist was only beginning. After graduation, he started organizing almost full time for the National Immigrant Youth Alliance (NIYA), a grassroots group of mostly undocumented students who believed civil disobedience to be more effective than legislative lobbying when it came to raising awareness of their plight. Saavedra took a lead role in NIYA's actions, and in the late summer of 2011 he was arrested while protesting in Charlotte, North Carolina. He spent three nights in jail, but emerged resolute and undeterred (the charges were eventually dropped). He and his fellow activists continued their campaign in cities across the country throughout the winter and spring of 2012. Polls showed Hispanic voters favoring Democrats by large margins, but many Dreamers attributed those numbers to Republican anti-immigration sentiment rather than anything the Obama administration had accomplished. While the president had offered tepid support for the DREAM Act, he was also responsible for tightened border security and record-breaking numbers of deportations (396,000 in 2011, according to the office of Immigration and Customs Enforcement). Then in June, just as Saavedra was preparing to "occupy" an Obama campaign office in Cincinnati, the president announced a "reprieve" program for certain undocumented immigrants. "Deferred Action for Childhood Arrivals" offered two-year deferrals, along with work permits, for people who met the requirements laid out in the DREAM Act. What it did not promise-and what the DREAM Act did-was a concrete road to citizenship. Saavedra carried on with his sit-in, which by then was making headlines. "'Deferred Action' was a compromise," Saavedra explains. "We got it because President Obama needed to win an election. Also, Senator Marco Rubio had introduced his own version of the DREAM Act, and that was troublesome for the Democrats." Buoyed by the media's coverage of their actions, the NIYA organizers now focused their energies on halting non-criminal deportations. They set their sights on the detention centers where immigrants were being held. One of the largest and most notorious was in Broward County, Florida. After waiting six hours to be processed, Saavedra was given a jump suit and placed in a cell with five other men. It was July 11, 2012. He didn't know when he'd be released, or even what country he'd be released into, so he concentrated on the task at hand. Slowly, methodically, over days and then weeks, Saavedra canvassed the detention center. He spoke with hundreds of detainees, recording their stories, advising them on their rights, and encouraging them to call a NIYA hotline, run by activists on the outside, where they could receive legal advice on their specific cases. What Saavedra found at Broward was extremely unsettling. According to NIYA, over 100 detainees met the government's "low-priority" threshold and shouldn't have been detained at all. Many needed medical care or had been victims of serious crimes. Dozens more had no criminal records. All existed in official limbo. The weeks dragged on and Saavedra began wondering if he, too, might be indefinitely detained. At the same time, his fellow detainees were becoming increasingly comfortable opening up to him, so he kept organizing and advocating, even starting a hunger strike. Then, one afternoon, his face appeared on Telemundo. The Broward infiltration was making national news. The following day, a detainee asked Saavedra for an autograph. His cover had been blown. Fearing an avalanche of negative press, exasperated authorities finally released him, but not before initiating deportation proceedings. He'd been in detention for twenty-three days. Framed by the bookshelf behind him, Saavedra leans back and sighs. From the kitchen comes the intoxicating smell of La Morada's signature platillo, the Senor Molcajete. I've asked him what his future holds, and for the first time in our two highly animated hours together he's not sure of what to say. Saavedra remains undocumented, and his deportation case is slowly winding its way through the courts. At a hearing in March, he stunned a judge by refusing to apply for deferred action. His full deportation hearing is set for September. "Whatever they mandate," he told a reporter, "we can organize against it. "On a broader scale, there have been some incremental gains since Broward. Hispanics, who again turned out in massive numbers for Obama, have been rewarded with another immigration "policy change." Immigration and Customs Enforcement has announced that only "serious criminal offenders" will be targeted for detention (though advocates, including Saavedra, claim the move is an attempt to deflect attention from another record year for deportations). Republicans have also shown signs of joining Democrats in finally helping craft a comprehensive immigration policy-be it a version of the DREAM Act or something else. This, too, could be perceived as purely reactionary, of course (the Hispanic vote having become crucial to national elections), but what is evident in any case is that change may be close at hand. If and when Dreamers are granted a path to citizenship, Saavedra and millions like him will no longer be outsiders looking in. They'll be Americans. "And what then?" I ask. "Maybe I'll cut back on organizing. I don't think it's sustainable as a career." "Write poetry," he says, reflexively. And then he smiles, warming to the idea. "Why not? It can't be any harder."